Good evening. 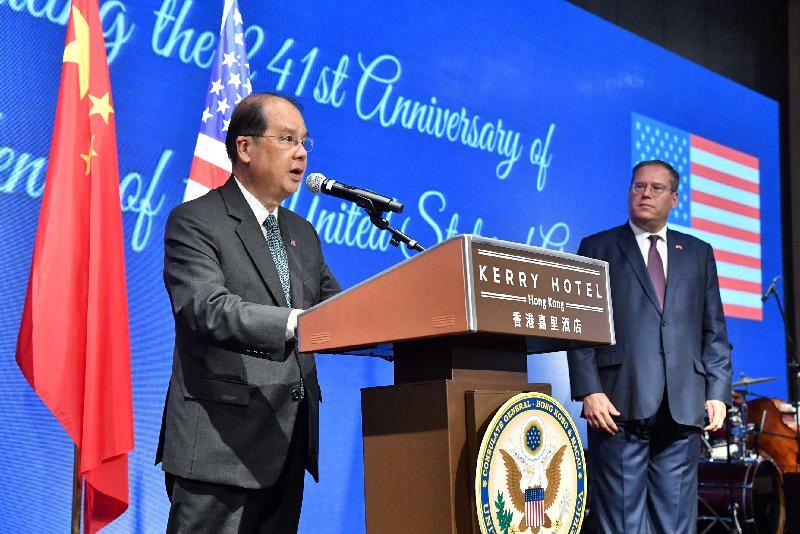 This is absolutely a week of and for celebrations: beginning last Saturday (July 1) with the 20th anniversary of the Hong Kong Special Administrative Region, and now with this good evening to honour the United States of America on its 241st Independence Day. 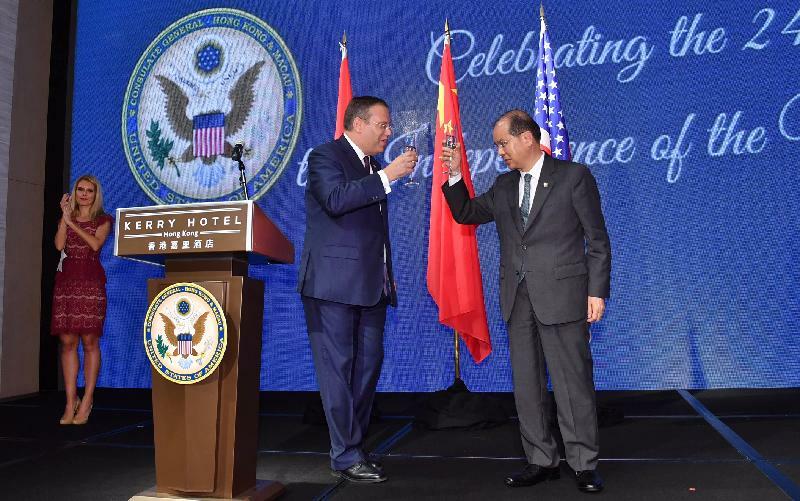 I am pleased to celebrate the long history of friendship of bilateral business and trade and deep-rooted cultural ties between the United States and Hong Kong. The United States is our second largest trading partner only after the Mainland of China. Last year, Hong Kong bought US$26.5 billion worth of goods made in America including vast quantities of meat and agricultural products. In fact, Hong Kong was the fifth largest market for beef and veal products and the sixth-largest importer for agricultural products of the United States. But, of course, Hong Kong has much more to offer. We are one of the world's most business friendly cities. Free market policies, the rule of law and free flow of information offer a level playing field for all companies. Hong Kong is home to about 1 400 US companies and brands, representing some of the most recognisable names in global business, from Apple and Bank of America to Google, Time Warner and, of course, Yahoo! With so many US companies doing business out of Hong Kong, it is no surprise that the American Chamber of Commerce in Hong Kong is the largest international chamber in this vibrant city, and also one of the biggest American chambers outside the United States. No surprise, either, that some 85 000 people of US nationality treat Hong Kong as their home. Our attractions for business, trade and investment are clear and compelling. The positive recognition of Hong Kong's strengths is also forcefully conveyed by the Washington-based Heritage Foundation which has named Hong Kong the freest economy in the world for the past 23 years in a row. The unique advantages of Hong Kong are guaranteed by the Basic Law and the principle of "one country, two systems". It means that information, capital and people flow freely and confidently in and out of Hong Kong. These are part and parcel of our strengths to be the "super-connector" to bring the Mainland and global business and investment together. And that, ladies and gentlemen, takes us also to our motherland's far-reaching Belt and Road Initiative, linking up more than 60 nations and 4.4 billion people across three continents that account for 30 per cent of global economic value. Hong Kong is both China's international financial capital and the world's China financial capital. We have the financial capacity and professional knowhow to help finance and develop Belt and Road projects. Last month, Hong Kong formally joined the Asian Infrastructure Investment Bank. We are all set to contribute to the success of the Bank and the Belt and Road projects that it helps drive. Alongside capital, the Belt and Road will be built on cooperation. President Xi Jinping said in his speech at the opening of the Belt and Road Forum in Beijing this year that the Belt and Road Initiative also opens up to all other countries. All countries, from either Asia, Europe, Africa or the Americas can be international collaboration partners of the Belt and Road Initiative. The pursuit of this initiative is based on extensive consultation, and its benefits will be shared by us all. In short, the Belt and Road is all about building bridges. Beyond physical links, that means actively seeking ways for nations and peoples, economies and companies, to come together. And Hong Kong looks forward to building bridges with US companies in pursuit of the vast promise that the Belt and Road offers us all. That is why my predecessor and now Chief Executive, Mrs Carrie Lam, visited the United States last June. Consul-General Tong, I fully understand that beyond trade and investment, there are issues that we may not always be in complete accord. Our response, then as now, is that the Hong Kong SAR Government places great importance and emphasis on protecting human rights and combatting crime in accordance with the Basic Law and the laws of Hong Kong. We are confident and determined that the principle of "one country, two systems" will continue to propel Hong Kong forward and, of course, underpin our stability and prosperity. President Xi made it abundantly clear in his speech at the Inaugural Ceremony of the Fifth-term Government of the Hong Kong SAR last Saturday here, and I quote, "To uphold and implement the principle of 'one country, two systems' meets the interests of the Hong Kong people, responds to the needs of maintaining Hong Kong's prosperity and stability, serves the fundamental interests of the nation, and meets the shared aspiration of all Chinese". Ladies and gentlemen, we will unswervingly implement the policy of "one country, two systems" and make sure that it is fully applied in Hong Kong without being bent or distorted. We will ensure that Hong Kong forges ahead and keeps scaling new heights. In this respect, I am grateful to you, Consul-General Tong, for your positive thoughts and remarks on this particularly important issue during a press interview last month, and I quote: "My basic story is that Hong Kong is working, and the idea of one country, two systems is working. The task for everyone now is to continue to build on the success, not question it". I fully agree. Thank you, Consul-General. I will certainly drink to that. Ladies and gentlemen, please join me now in a toast: to the great nation of the United States of America on its 241st Independence Day.